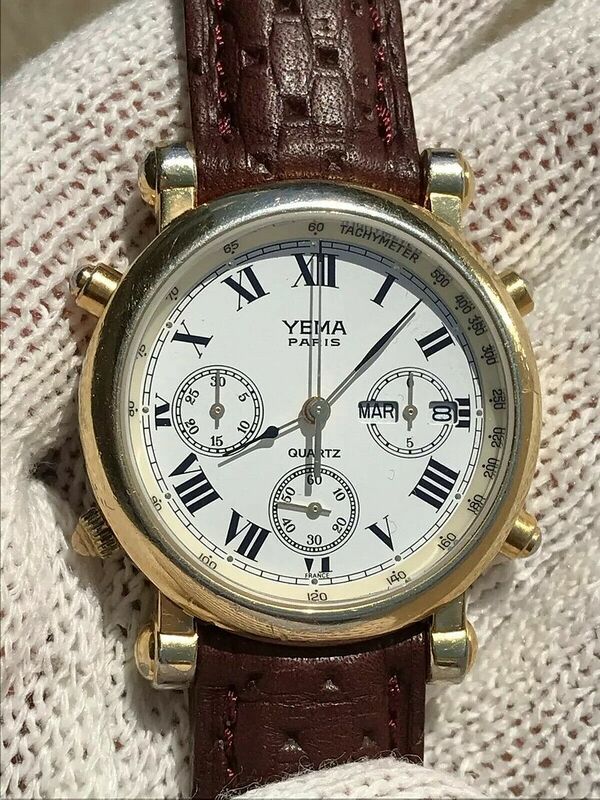 This dressy Yema N81W43, in average worn condition, with some obvious rubbing wear to the gold plating, was listed yesterday evening by an Albanian eBay seller, as a 5-day auction with a highly over-optimistic opening bid price of $199. 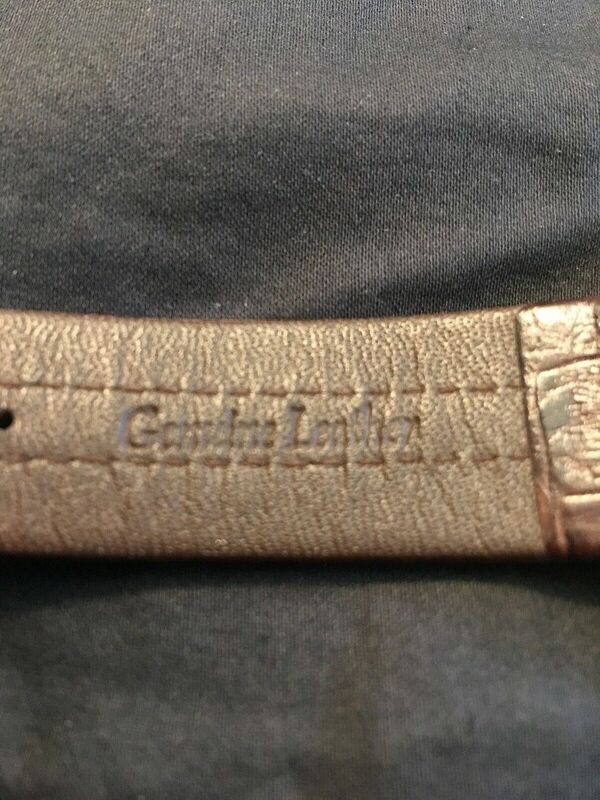 THE ITEM YOU SEE IS THE ONE THAT YOU WILL RECIVE SO PLEASE SEE WELL THE PHOTOS FOR MORE. 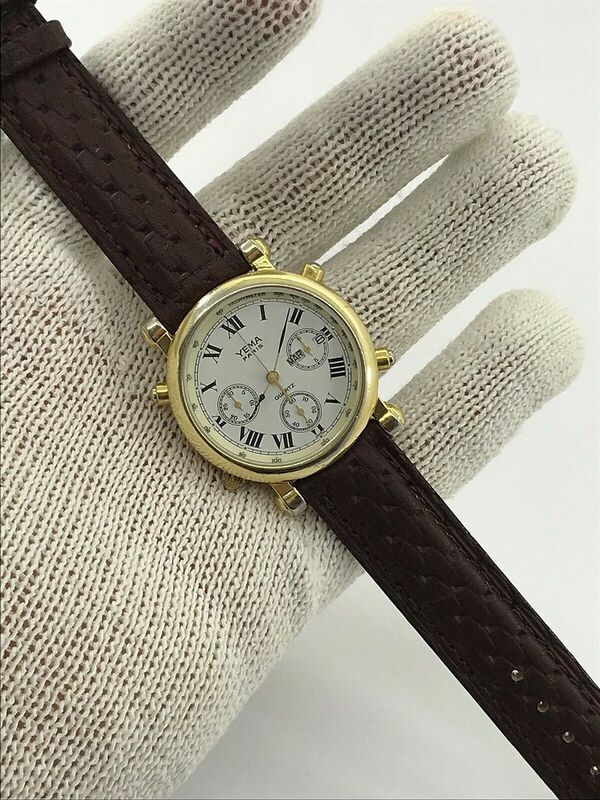 THE SHIPPING COST IS 12 USD AND IT TAKE 2-3 WEEKS UP TO 30 DAYS AND WITH CANADA AND SOME OTHER CITY SOMETIME MORE THAN TWO MONTHS. 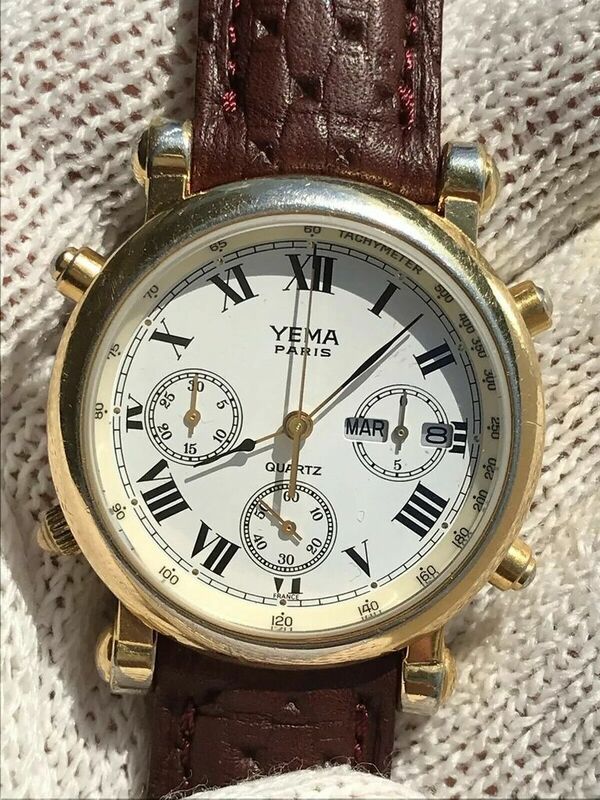 This Yema Spationaute III, fitted with a nondescript unidentified non-original strap, was listed this morning by an Austrian eBay seller, with an almost laughable 'pie-in-the-sky' Buy-it-now price of 599 Euros. 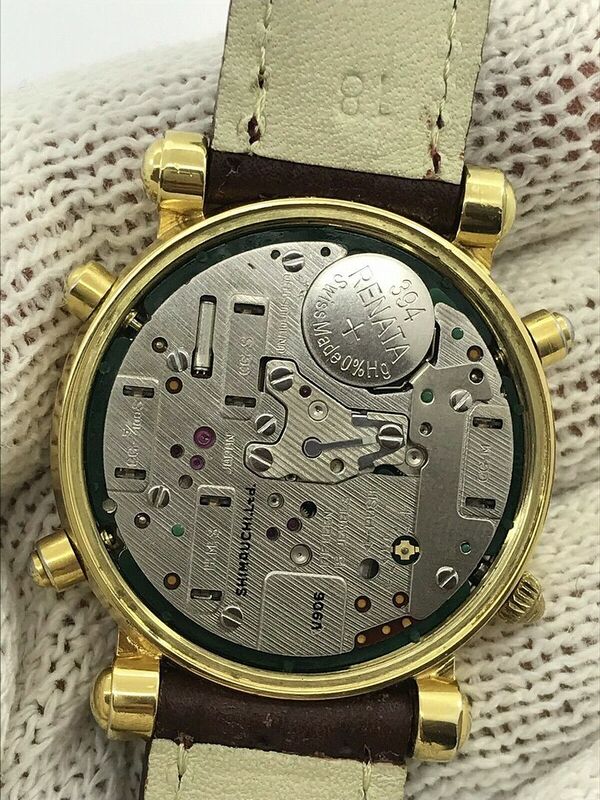 Apart from being in no better than average used condition, it's also fitted with a non-original crown and constant seconds hand. 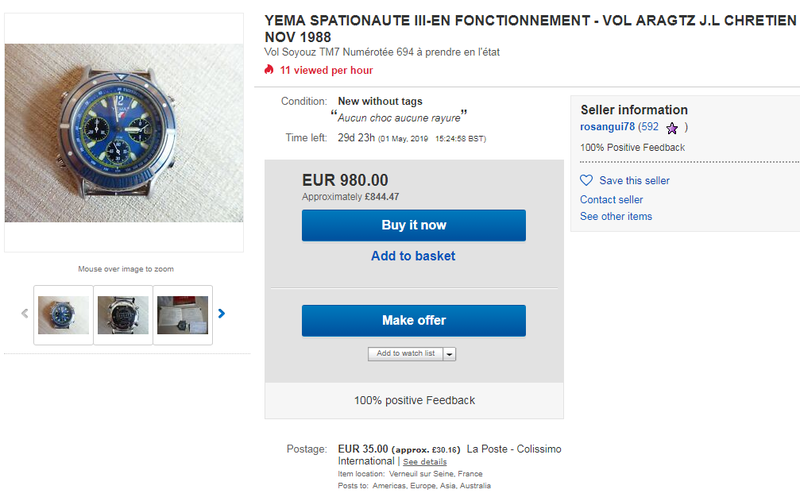 Yema Spationaute 3, ca 1988. 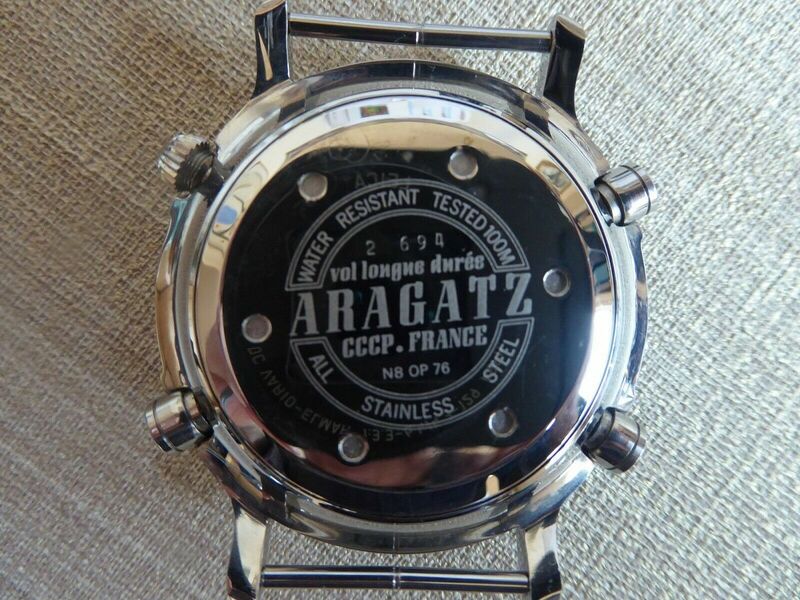 Diese Uhren wurde anlässlich einer französisch russischen Raummission Aragatz getragen. Quarzwerk, Batterie neu, läuft hervorragend. 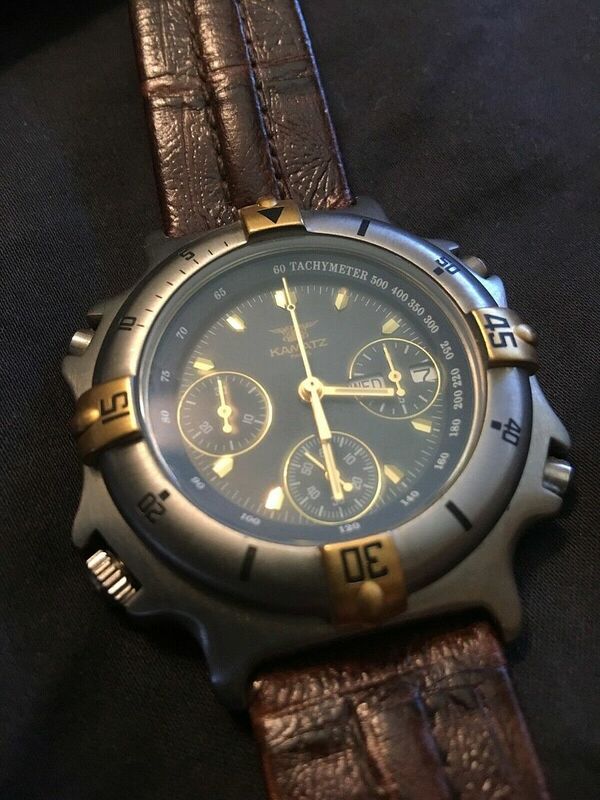 Eine Uhr die man nicht oft findet. Ein Sammlerstück da nicht viele gebaut wurden. Siehe meine Bewertungen und andere Artikel. 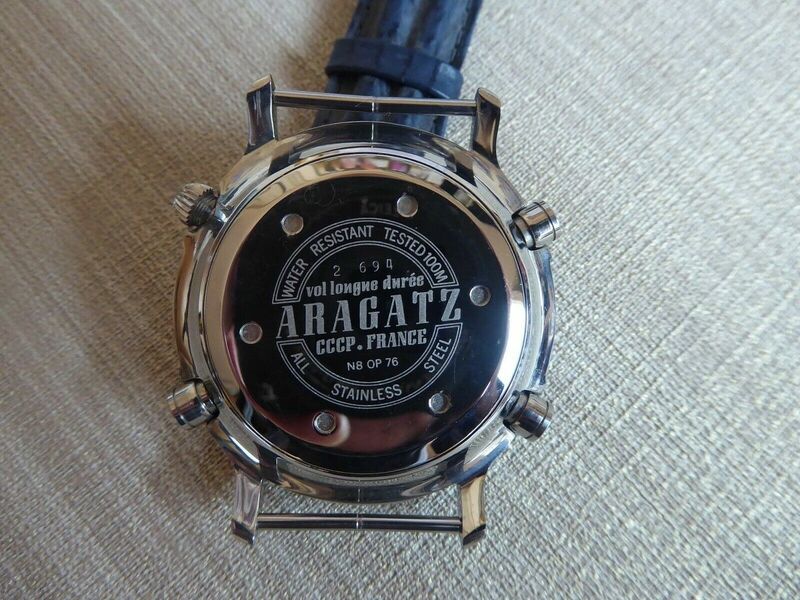 These watches were worn during the French-Russian space mission Aragatz. 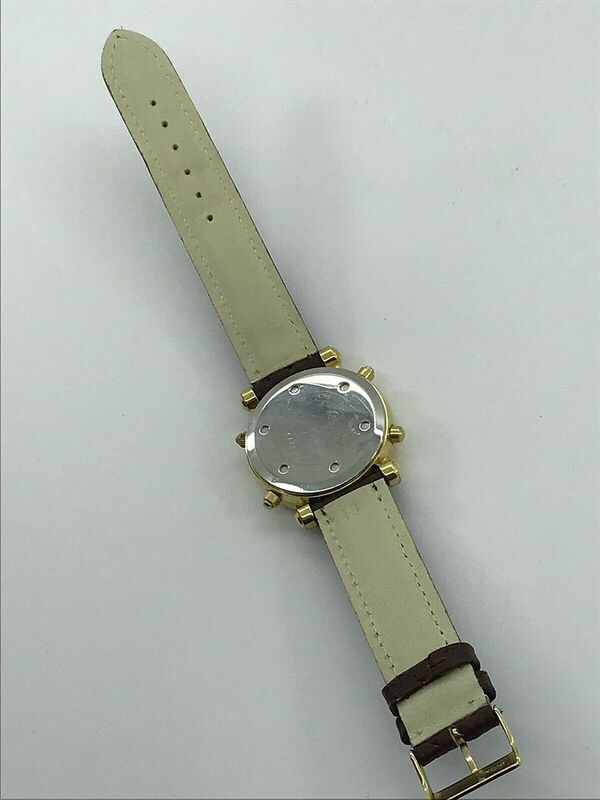 Quartz movement, battery new, runs great. 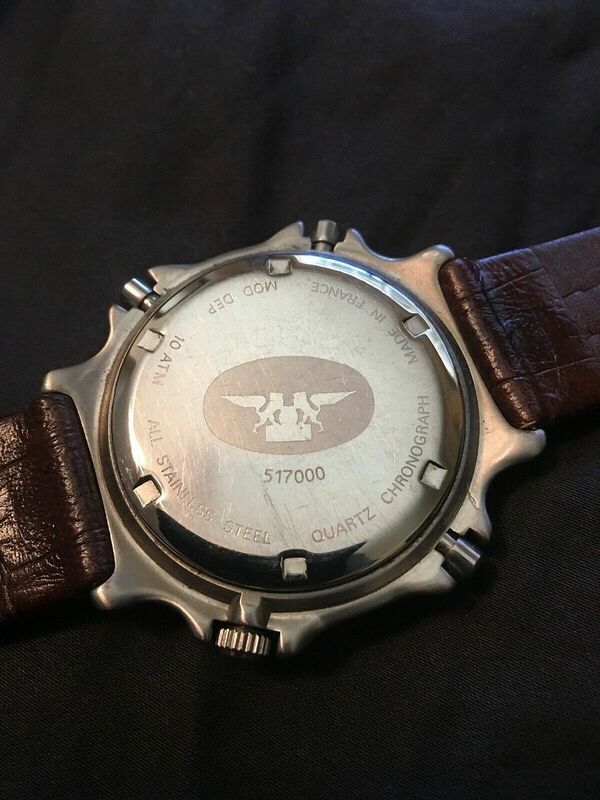 A watch that you do not find often. A collector's item because not many were built. See my reviews and other articles. 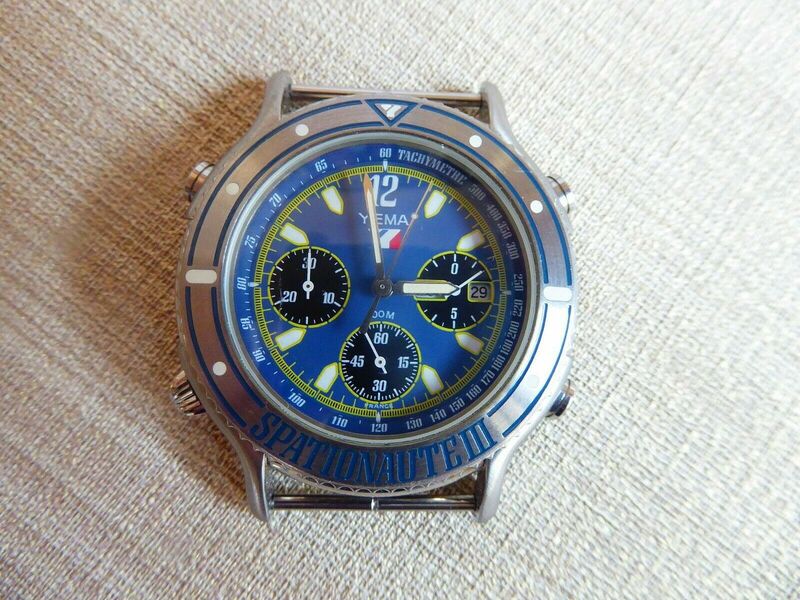 Today was April Fool's Day and it looks like the Austrian eBay seller found someone gullible enough to fall for it. 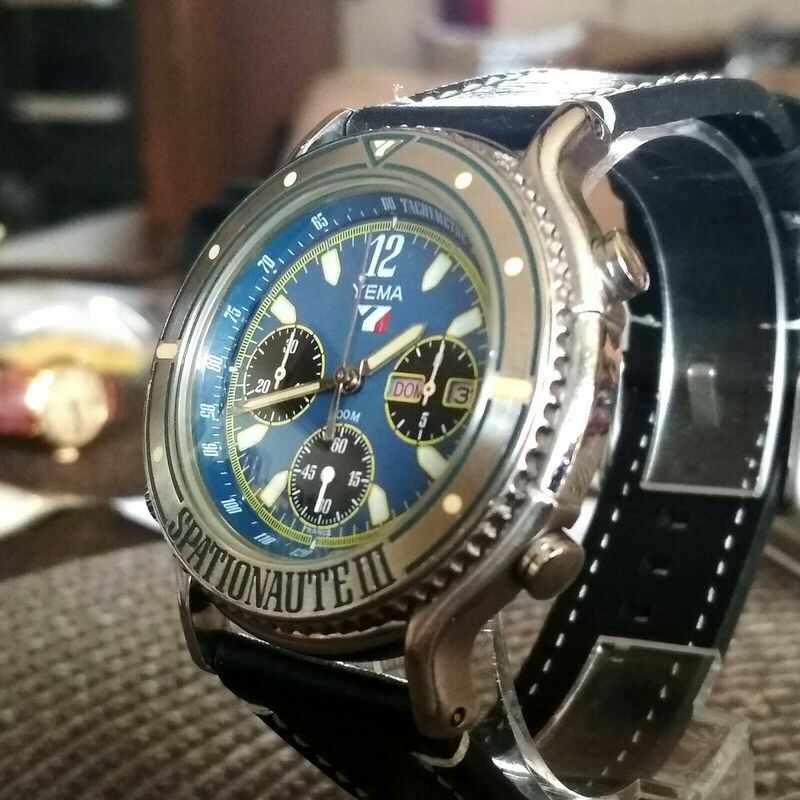 It sold about 15 minutes ago, for somewhat less than his Buy-it-Now price, but still far more than a Spationaute III is realistically worth in this less than original condition. 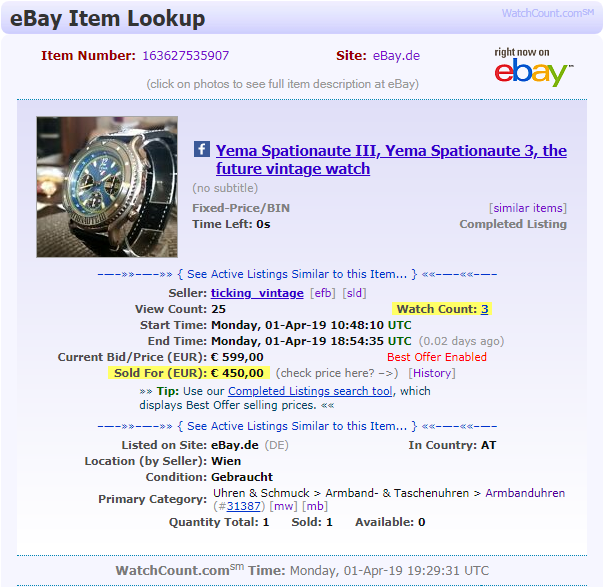 WatchCount.com's Look-up tool reveals it sold for a best offer of 450 Euros. 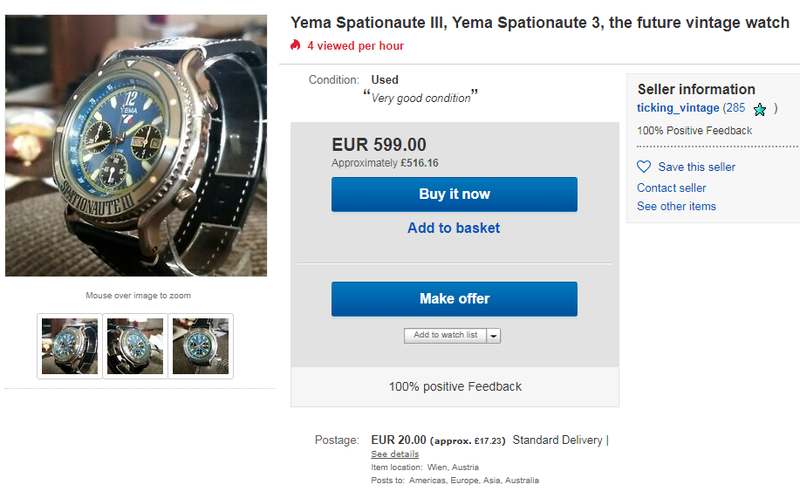 Some of you may have been following the long-running saga of this particular Yema Spationaute III. 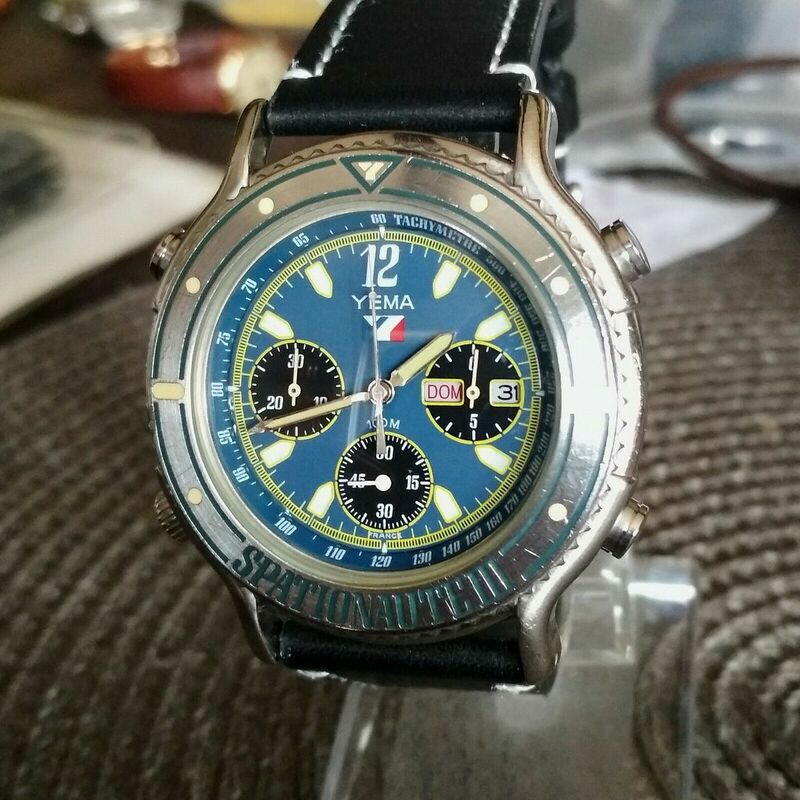 It started about halfway down page 31, when the deluded French eBay seller rosangui78 first listed it at the beginning of November last year, with an absolutely ludicrous 'pie-in-the-sky' Buy-it-Now price of 1200 Euros !! 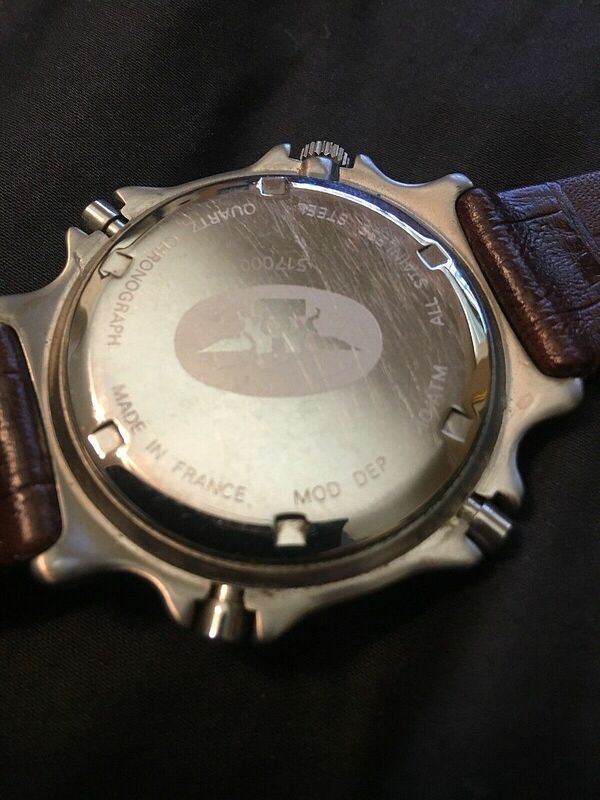 At the time it was a non-runner, still fitted with what was presumably the original battery, long since flat, which had been left inside for around 23 years. 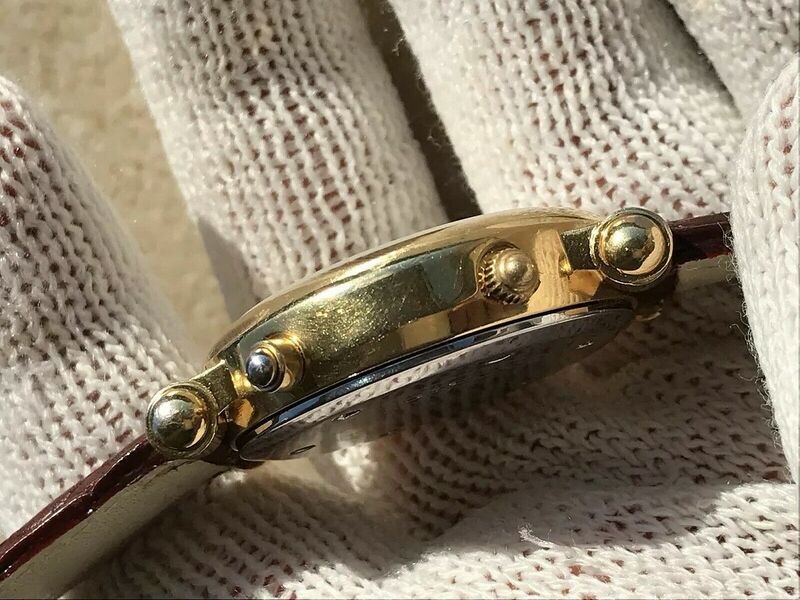 In January this year, he finally had the battery replaced and re-listed it again, this time at 999 Euros (see updates on the previous page). Needless to say it has remained unsold. 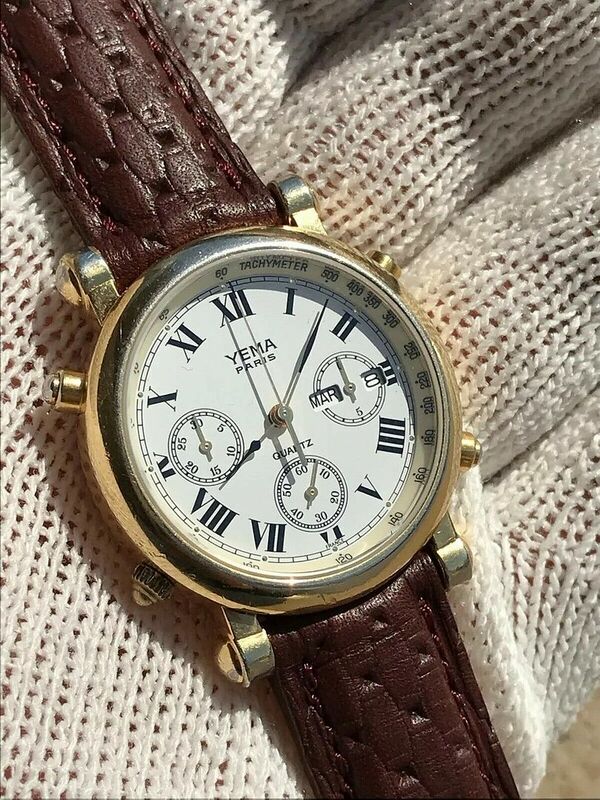 This was his most recent re-listing, which ended a couple of days ago. So today being April Fool's day, it's appropriate that he re-listed it once again. In this latest re-listing he's uploaded a new set of photos and increased the 'pie-in-the-sky' Buy-it-Now price back up to 980 Euros. Couple of observations: It looks like he's now located the correct Yema N7 / N8 / N9 owners manual. Note there's (half ?) 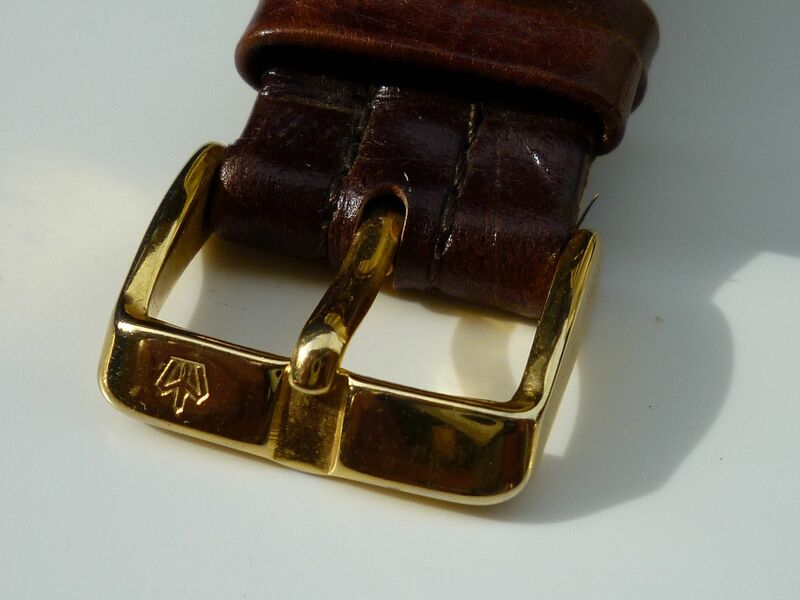 a strap shown in a couple of the photos (different to that shown in his previous set). 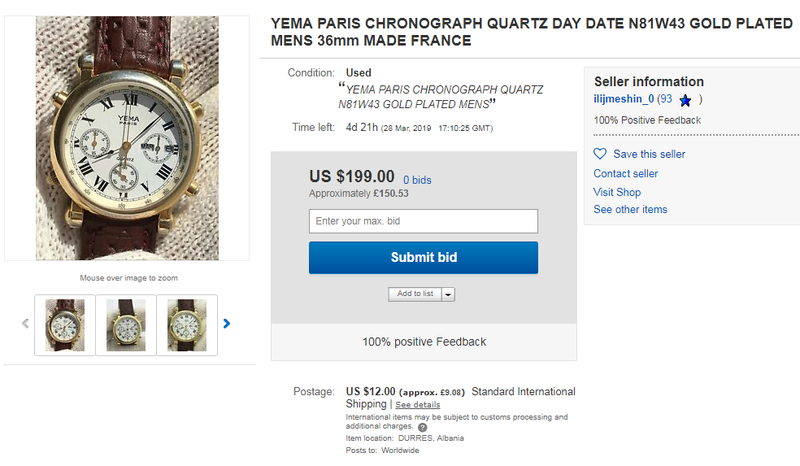 Also, although he lists the condition as: "Aucun choc aucune rayure", if you zoom in the primary image, there appears to be a light scratch on the crystal through the '20' mark on the minute counting sub-dial. I'm not going to bother copying and pasting the description again. Looks pretty much the same as before, with the same old mistakes carried forward. 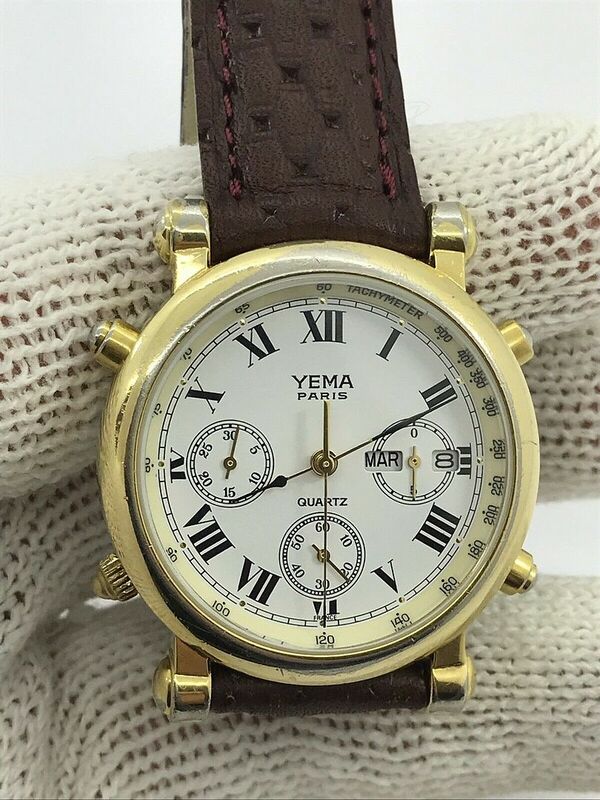 A rather familiar looking Yema N81W63, fitted with a Lizard strap, was listed earlier this evening, by a Canadian eBay seller, as a 7-day auction, with an opening bid price of $250 Cdn (equivalent to approx. 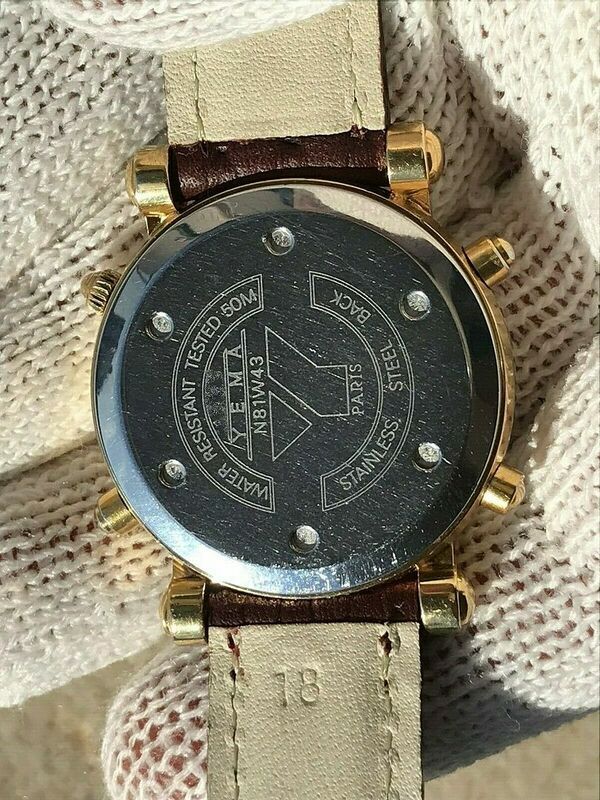 $187.50 USD). 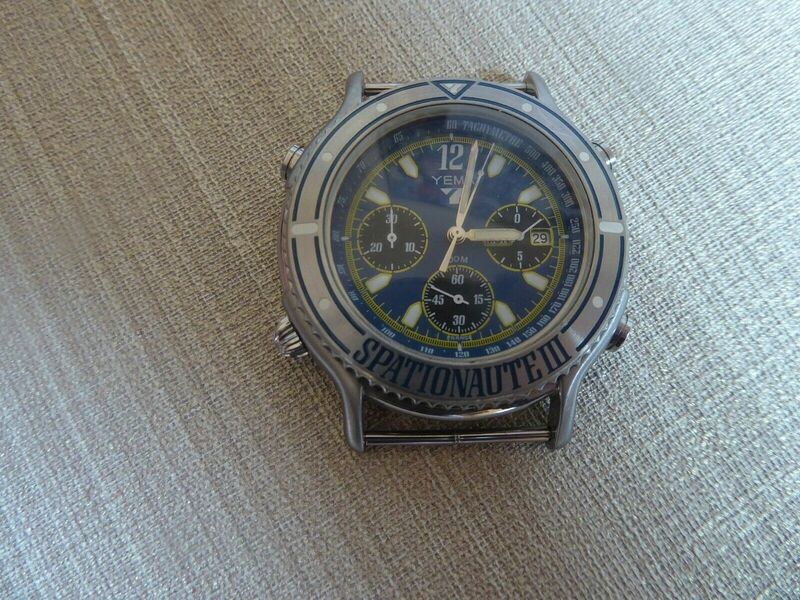 The seller has falsely titled the listing as 'NOS' and claims not to know the watch's history. He has a very short memory. Fortunately I don't - plus we have this ongoing thread for reference. 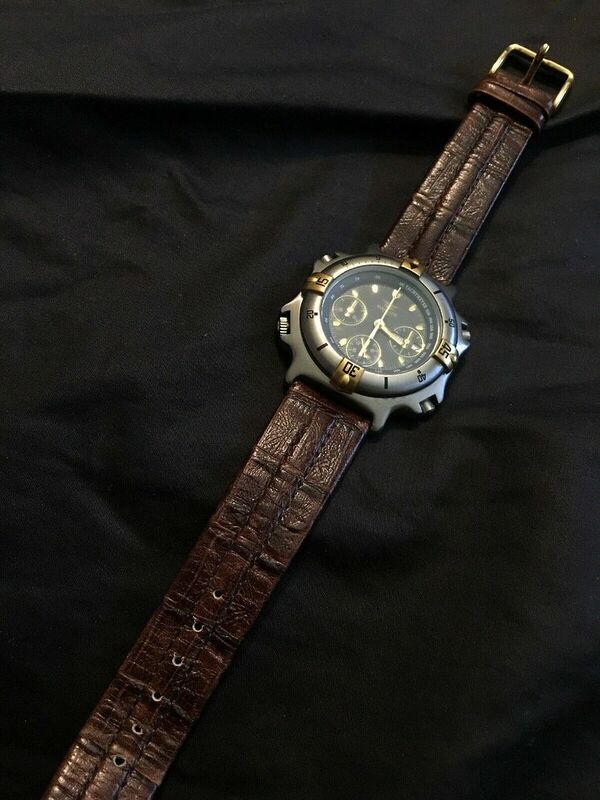 This Yema N81W63 belonged to forum member Don, up until the end of January, when he sold it on eBay for $124. Just scroll back up the page for full details. 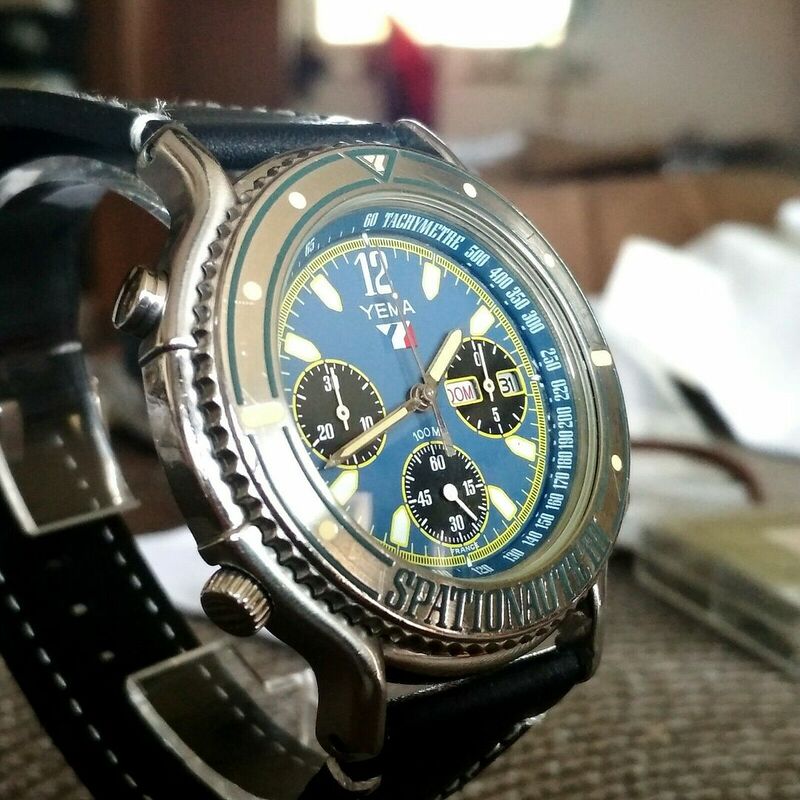 Since I made the above partially quoted post in the first week of March, Canadian eBay seller vintage_wheel_time (a.k.a. 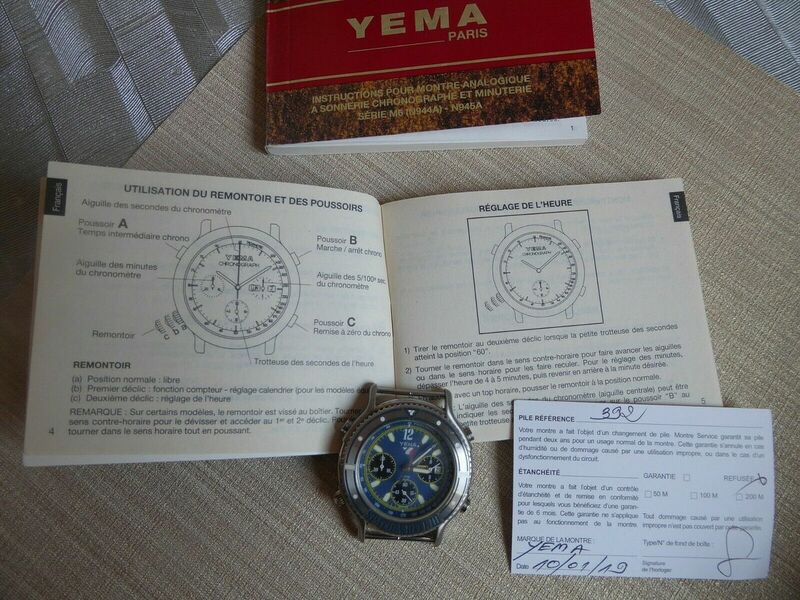 forum member Thierry) had re-listed the ex-Don Yema N81W63 10 times - as 3-day auctions. 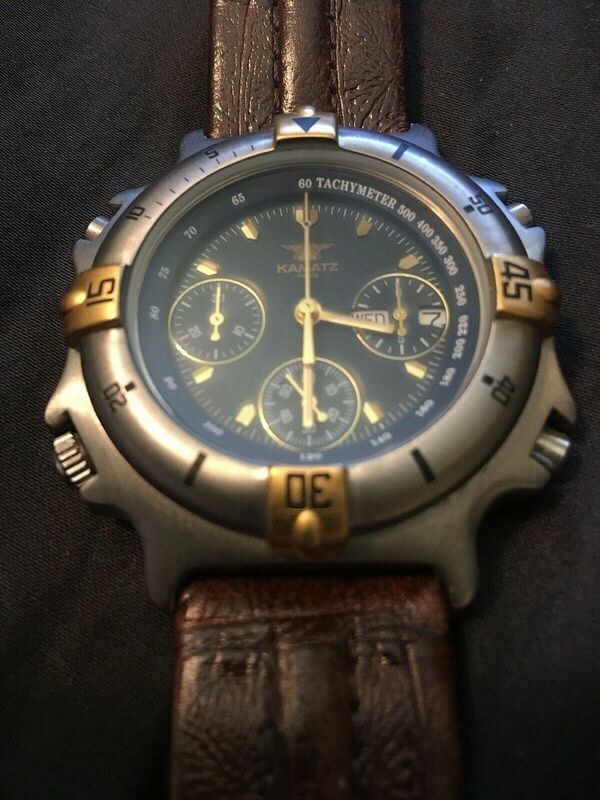 Checking my eBay watching page, he finally appears to have managed to find a buyer this lunchtime. 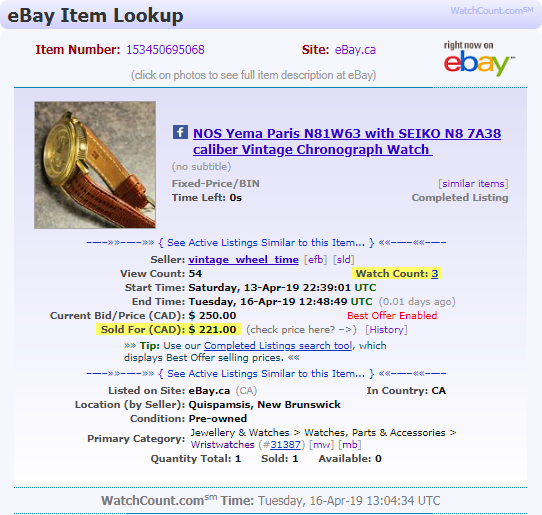 WatchCount.com reveals it sold for a best offer of $221 CAD. (approx. 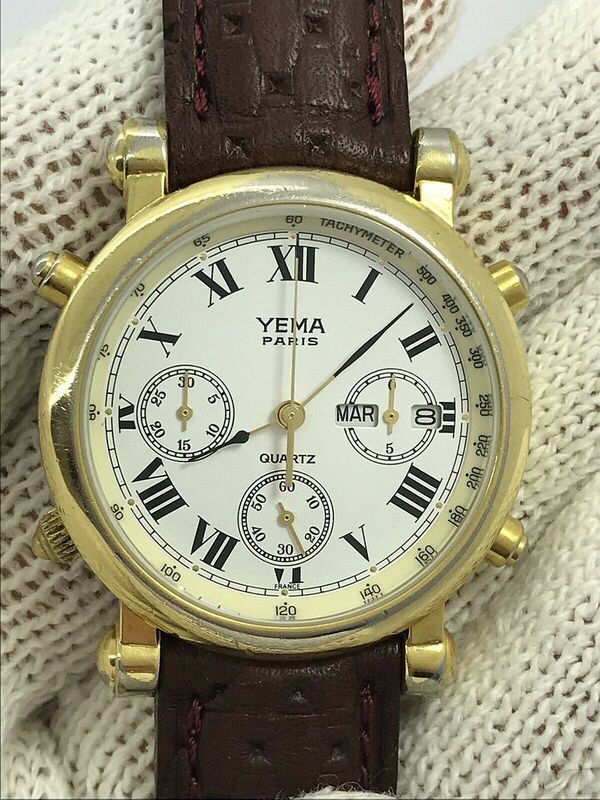 $165 US). 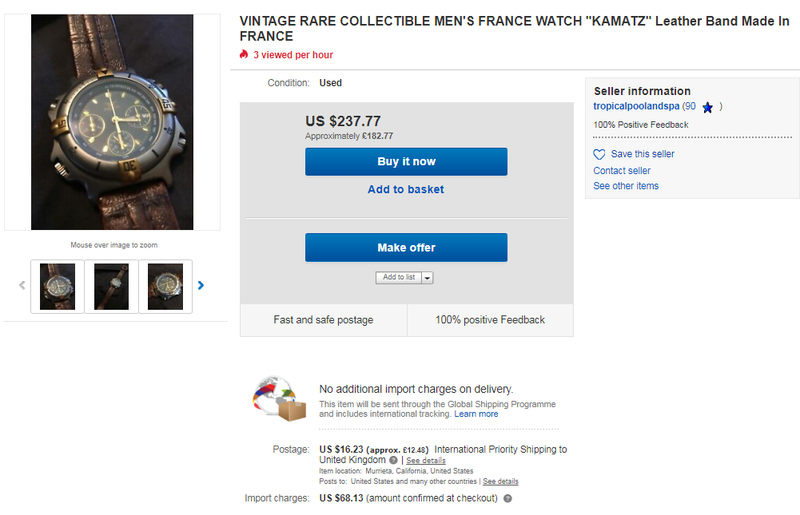 This Kamatz 517000 in lightly used condition was listed yesterday evening by a US eBay seller, with a laughable 'pie-in-the-sky' Buy-it-Now price of $237.77 - or the option to make a much lower more sensible offer. 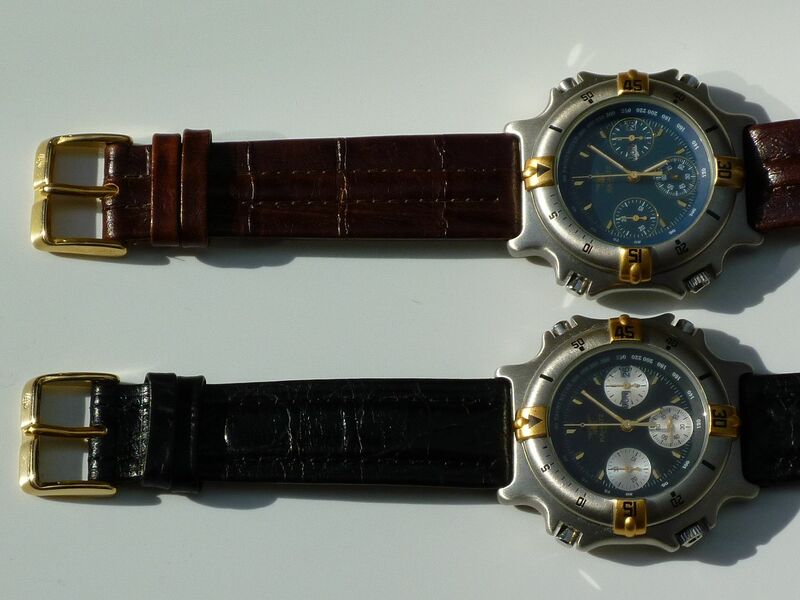 Not only is his asking price almost double what anybody in their right mind might consider paying for one of these 'fugly' watches, but it also needs a new battery ! To add insult to injury, he's offering it through eBay's dysfunctional GSP programme, which potentially adds another $84 in charges on top of his ridiculous asking price ! 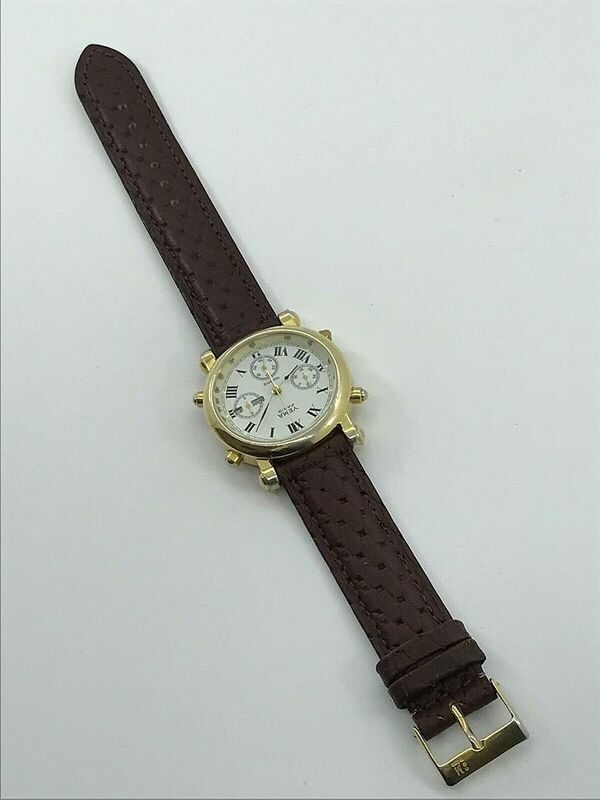 VINTAGE RARE COLLECTIBLE MEN'S FRANCE WATCH "KAMATZ" Leather Band Made In FRANCE. Condition is Pre-owned. Needs battery. 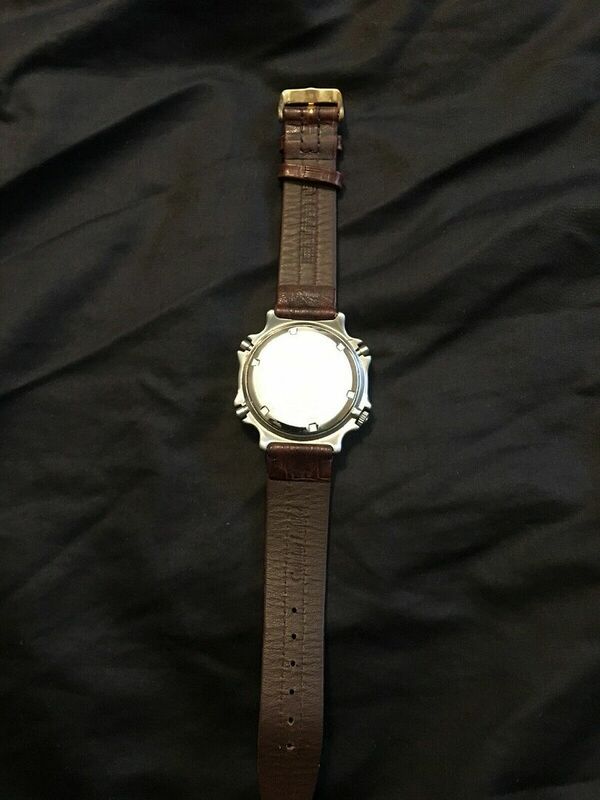 Incidentally, for anyone who might actually be interested, that 'Genuine Leather' dogshit brown strap is the original factory fitment. 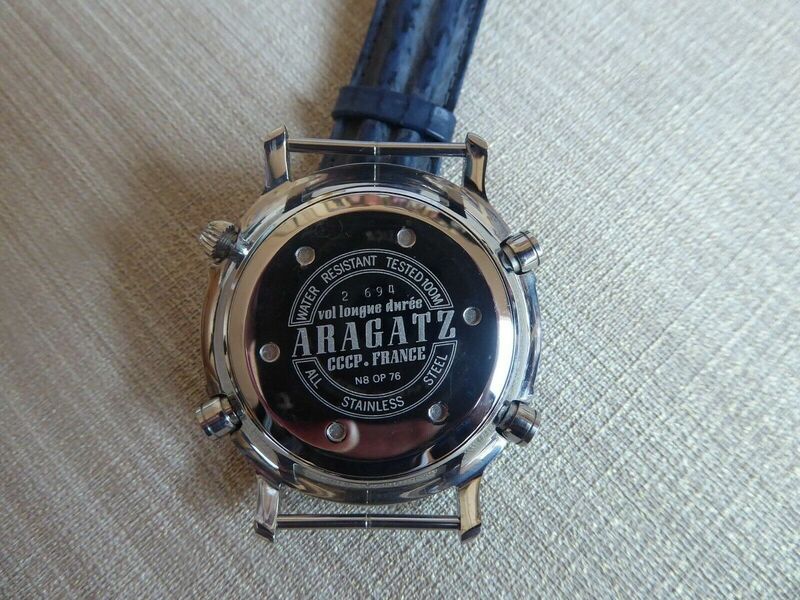 Before Kamatz started using their own branded straps, they second sourced straps from a variety of other OEM's. 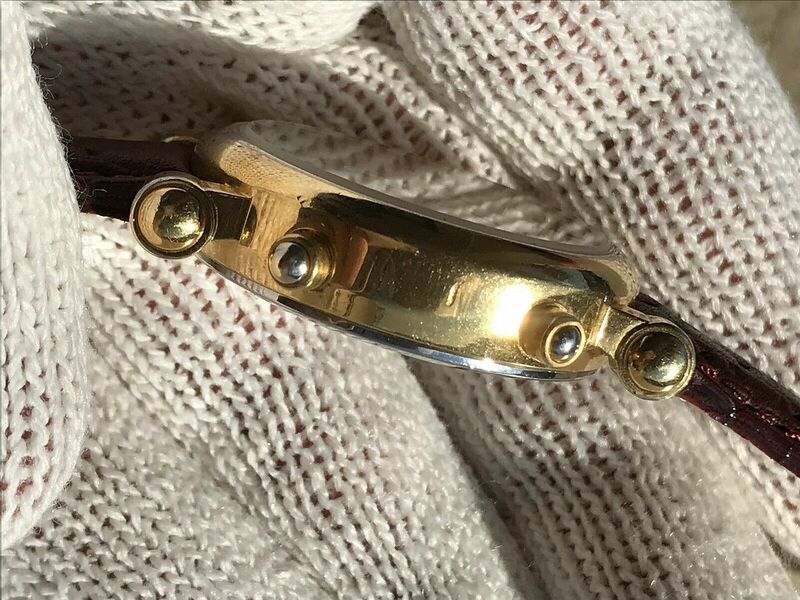 I instantly recognised this as a Poljot strap. They were fitted to the first couple of Kamatz 517000's (both NOS) that I ever bought. 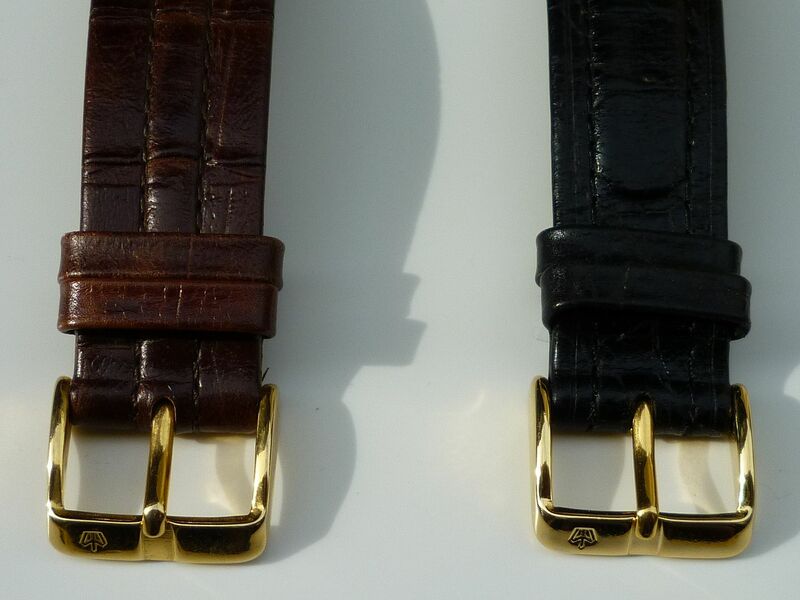 Their consistency is more akin to soggy cardboard than 'Genuine Leather'. If you take the trouble to read what I wrote properly, you will see that I did not accuse you of profiteering. 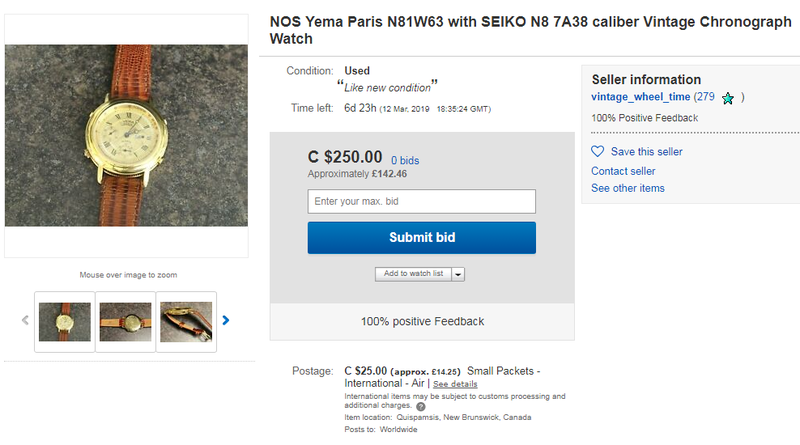 I accused you of lying about the watch's condition - by your inclusion of 'NOS' as the first word in the title of your listing and your further exaggeration in the description. 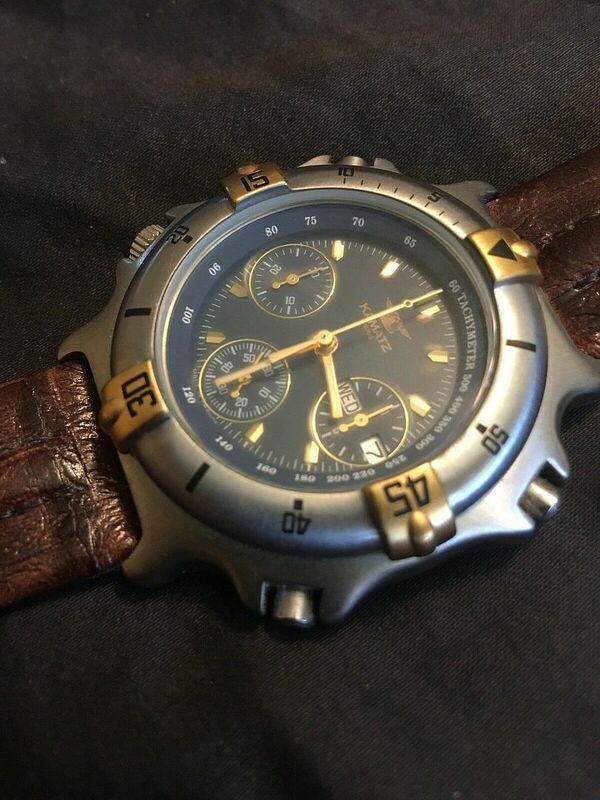 If you honestly believe that watch looks like 'NOS', I strongly recommend an urgent visit to the optician. As for your statement that you have a short memory, the fact that you conveniently claim to have forgotten that you bought it from Don at the end of January, then listed it for sale a little over a month later, you do indeed appear to have the memory span of a goldfish. This was only your second post in over two years of membership (the first was a brief intro'), so I don't consider you a valued contributor. Nor do I appreciate your sarcastic 'know it all' remarks. If you no longer wish to continue being a member of this forum, you're headed in the right direction. You know where the door is .... Perhaps you and your new Australian friend can start a new forum together. "As described. 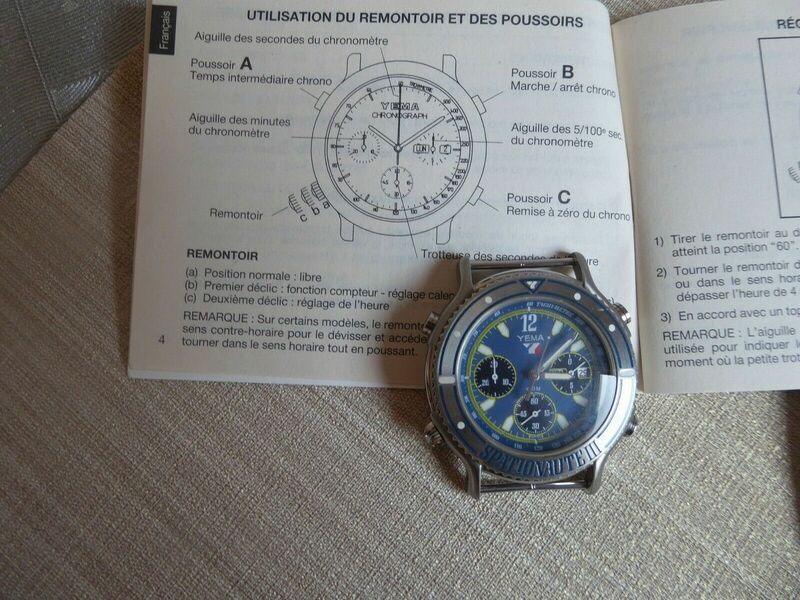 Seller's description of watch functions was superb. A+++"